In this feature we introduce you to the many different ways in which omotenashi style hospitality is extended and the things in which it is given form, to appeal to the senses through the eyes, ears and palate of a guest. We trust we will help you to savour the best of Japan’s omotenashi culture, by alerting you to watch out for, listen out for and hone your sensitivity to these almost imperceptible ministrations. The Kannon (Kwan Yin) Sutra mentions fragrance, highlighting the way in which scents have from ancient times had a position of importance in religious and cultural activities. Beautiful scents and sounds were said to lead to paradise. Aromas that guide one to a state other than the everyday, perhaps play a part in linking the human sense of smell to spirituality. Today we have the culture of scent – which, it may be said, holds special significance in Japan – of which the most typical expression of this form of sensual enjoyment is incense. 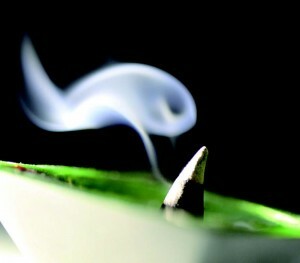 The aroma of incense is the very essence of a harmonious world. There are spicy ingredients, pungent to the nose, such as sandalwood, frankincense, the camphor-like borneol and cinnamon. There are woody scents that calm the emotions, and there are fragrances that provide a strong sense of refreshment. Each emits its own unique ‘note’. For that reason, if mixed in the wrong way, scents may war with each other, resulting in a disagreeable smell. Historically, however, Japan has succeeded in cleverly combining several singular incense ingredients to create a harmoniously aromatic world of scent. In these invisible aromas we can sense the important place of harmony in the Japanese psyche. The history of incense blending is long, dating back to a time when the nobles of the Heian period – from the 8th to the 12th century – themselves mixed incense, and we are advised to this day that those scent blends were born of a transcendent aesthetic sensibility. Fragrances were not smelt with the nose, but were put together in the brain; they were a product of creativity. 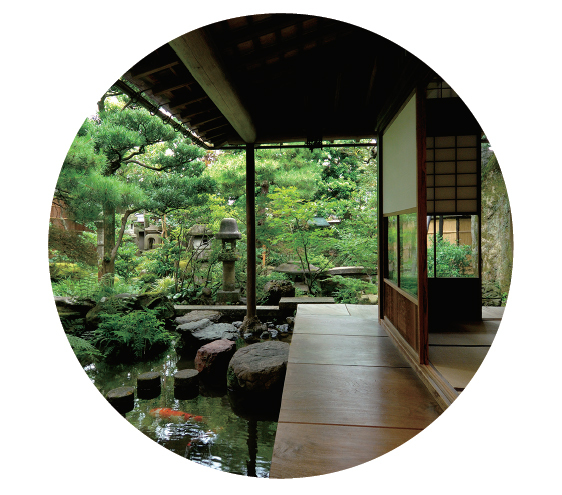 The sensibility and aesthetic awareness cultivated in Japan evolved and was protected, simply because Japanese people lived in harmony with nature, learned from the providence of nature and experienced nature in their souls, and because in their hearts was the spirit of wa, loosely translated as ‘harmony’. Incense has also been widely used in Japan in the hosting of guests. Putting out the flame on the tip of a stick of incense by fanning it with an open palm means the vapours are stabilised to just the proper degree and from the incense rises a white smoke that visually draws the observer in. Lighting some incense and placing it on a table imparts to guests in that space an exalted, tranquil moment in time. Guests on the receiving end of this aspect of omotenashi could dreamily gaze on the trembling smoke, or close their eyes, forget everything and relax, to become one with the fragrance. The average person in their daily lives is busy, experiences unease and finds it difficult to relax. In Japan, therefore, particularly when visited by a guest the host will seek to restore serenity by lighting incense and encouraging the visitor to gradually relax and be at ease. It is as if the host asks the smoke to extend a hand to the guest to guide them into a sacred space.